Briefly: I offer my thoughts on Apple’s newest operating system on pre-iPhone 6 devices. Upgrading my iPhone 5s took well over an hour, possibly closer to an hour and a half. TO do this on a 16 GB phone, I needed 5.7 GB of free space; space I didn’t have. So, I went to see what applications were taking up space. The biggest culprit? BBM. That sucker was using up 933 MB of space with no way to clear it out. Tell me what could BBM possibly need that takes up 933 MB? I deleted that, and other apps and continued with the long upgrade process. We’re in a time where Apple is either cash-greedy or unwilling to loosen up on memory sizes, leading to phones with impossibly low amounts of free memory. In a year, when you go to update your 16 GB iPhone 6, it will be impossible. Update: For some, the iOS 8 upgrade required as much as 5.7 GB to proceed, and that was just too much. Many had to start deleting pictures, applications, and still could not upgrade. Being a nuisance for many users, and impossible for others, lead to record low numbers of updates to iOS 8. Reports are suggesting even lower than iOS 6’s upgrade cycle. No word yet on whether Apple will take steps to reduce the size of the update. Base apps (that I largely avoid) have gone through numerous updates. I noticed the clock icon is a real, ticking clock. This falls into that category of things you might not have noticed before, but notice now. There’s also a “Tips” app that cannot be removed. Presumably Apple felt tips should never be far from a user’s reach. One of the bigger new apps here, “health” is almost immediately useless (unless you like manually entering your health information). Probably the only real nifty feature here is “Medical ID” that allows you to create a medical workup (of sorts) that can be accessed through the “Emergency call” lock screen. I can see that being quite useful to emergency workers in the field (if this is popularly used). Maybe in the future it might include an organ donor card, or even basic insurance or medical identification. The “quick launch” area is largely unchanged but for some shading and icon differences. I think this will look better on a larger iPhone, but have the same amount of utility. I do wish Apple would add more tools to this, or make it at least configurable. Passbook is better. The stupid help card has smartly been moved to the place you add cards, leaving passbook only holding actual passbook cards. On an non-iPhone 6, Passbook is going do exactly what it used to do, so cleaning it up makes this a little more useful. The task switching screen includes quick access to recently contacted people. And, here’s the thing Apple doesn’t get: recently contacted people in Apple-only applications doesn’t mean this utility has any use in the long run. In fact, the opposite. This actually becomes a waste of real estate over time. Signs of Apple’s siloed-off systems are present everywhere in iOS, and never more obvious in places like this (that are supposed to offer “quick access”). Certain apps will need need more upgrading than others. 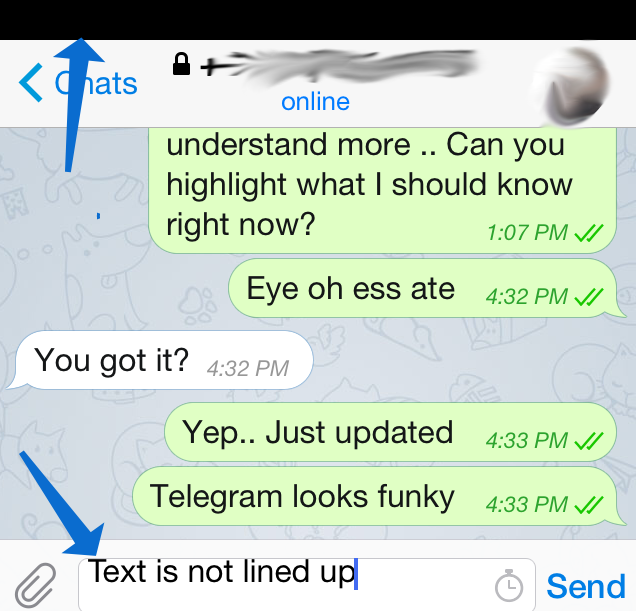 Telegram (a chat tool) seems to have been hit hard by the iOS 8 upgrade. The top part of the screen is a large black bar, while entered text (in a message) hugs the top of the entry field a little too tight. I assume that every app developer has to go through these things and make them all right so users aren’t slapped with these problems. Immediately after upgrading my iPad Mini, I counted 18 updates. There are clearly a bunch of smaller updates that I’ll see as I use this new version. Of interest is Facetime, which apparently has an audio mode , and the background of the app is live video generated from the device’s front camera. Subtle. Cool. I generally like what I see. Some things I probably won’t tell for a while, like battery life. But, what seems to be most out of place is calling this iOS version 8.0. It makes sense because of a new phone’s release, but there aren’t really that many changes here to justify an entirely new version progression. Apple does tend to do these kinds of things, so it’s understandable. So far, I’ve had no issues with iOS 8 on an iPhone 5s or iPad Mini (non-retina), so you should expect the same. 1. Was that there before?